something is displayed incorrectly or is not working under your browser. Click here and write a note. Your comments will improve the DioneOS system. Version for ARM Cortex-M3 was tested automatically (full code coverage: all functions, marcos, code lines, conditions, etc.). Tests were performed on STM32L162. DioneOS version for ARM Cortex-M3 processor was released. State machine support has been added to the system. Pattern for state machine coding is defined. ELESOFTROM entered Texas Instruments MCU Developer Network. This program gathers companies that develop software for TI MCUs and provide professional services in this domain. Support for regular MSP430 microcontroller and small code model has been added. First release of the DioneOS System. Support for MSP430x and large code model. * Why to use multithreaded programming? 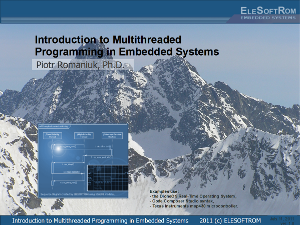 The tutorial is an introduction to multithreaded programming. It illustrates common errors and practices that should be avoided. It presents 'one-threaded' model and explains concurrency between the main loop and ISR. Next, it discusses basic aspects of multithreaded firmware, including system structure, internal synchronisation, management of common resources, time related events, etc. Finally, it describes effective methods for debugging real-time software.